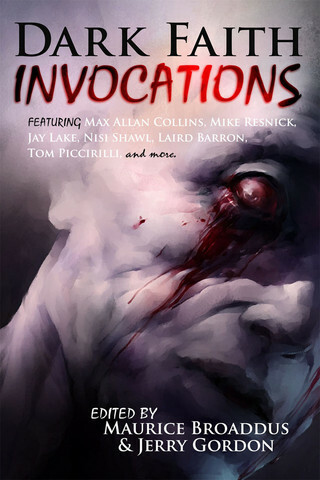 Dark Faith: Invocations has been out for a few weeks now, but you wouldn’t really know it from my blogging here. You’d almost think I was embarrassed about it. That’s not the case at all. Quite the opposite. I’m very proud both of being in this book, and of the story I contributed. What I am, is a little frightened. ‘The Sandfather’ is a story that exposes me. It stems from personal tragedy, one which I struggle to share properly with those around me. Having it in print is a bit like stripping naked and walking on stage. A couple of years ago, I had a story called ‘Sandboys’ published in the original Dark Faith anthology, also from Apex Books. That story also exposed me. It was written in the aftermath of one of the worst things that’s ever happened to me, and is so overtly a cry of pain that I still can’t stand to read it. Doing so puts me back in those moments, which launched me into a spiralling battle with alcohol that I ultimately lost (and only this year stumbled haphazardly clear of). It’s less a story, and more of a vignette, a little portrait of disempowerment and loss. Although the story ends on a note of hope, that ending is the one artificial chime in the story. It’s also the one piece of storytelling in the entire piece – a tiny moment of acknowledgement that the gun barrel I felt myself staring down wasn’t something I had to point at the reader too. ‘Sandboys’ splits readers who have come across it into two camps. Some, it floors. It throws them into the hole I was in, and forces them to stay there awhile. It makes people cry. Others – most, I suspect – don’t get it and move on. I talked about this a little on a panel at Anthocon, about how writers can draw on tragedy to inform their work. I held it up, in fact, as a way not to do this. ‘Sandboys’ is too unfiltered to properly reach out to readers. Those who were knocked sideways by it were those who could relate directly to the specific tragedy I was describing. Either they had been there themselves, or somebody close to them had. Perhaps there were a few more who were particularly empathetic, and responded to the rawness of the whole thing. ‘Sandboys’ is written by a man who knows how to write, and is venting his pain to stop himself cracking up. ‘The Sandfather’ is a little different. I’ve more perspective now. I’ve enough distance from the event to filter it. I can divorce myself just a little from the things I’m drawing on to make sure the story reaches further, that those who haven’t necessarily experienced a specific thing have other doors through which to enter that little world. ‘The Sandfather’ is the work of a writer, drawing on something personal, but using it to create a story for other people. Where as ‘Sandboys’ is indulgent, ‘The Sandfather’ is better controlled and crafted. It’s sort of a sequel, but if you haven’t read the first, you’d never know. The story assumes you haven’t, and begins at the beginning. If you have read the first though, this takes place several years later. That moment of artificial hope at the end of the first story? Well, I know from experience that pretend hope is no hope at all, and the story reflects that. In real life, hope, like faith, can only exist in the absence of certainty. The ending of ‘The Sandfather’ reflects that much more cogently than ‘Sandboys’ did. So far the book has picked up excellent reviews. Fangoria liked it, as did SpecMusicMuse. Rue Morgue magazine liked it too, though that one’s not online. I wouldn’t normally jinx a book out loud by saying so, but I think there will be more to come. Searching on iTunes or Smashwords will also bring it up, though I can’t access either right now to give you the links. Seek it out, and let me know what you think. If you want a bit more background about the book as a whole, you can also check out the editors chatting about it here.